Since learning how to crochet, I have wanted to make a coffee cup cozy. I decided that I wanted to start out with something simple so I made the basic cozy pattern and used a small heart pattern to add to the cozy. I started out by trying figuring out how many chains was needed to go around the coffee cup. With my stitches it was 30 but you will need to double check yours to make sure it will fit your cup. Everyone crochet just a little bit different so adjust the pattern as you need. Row 2-10: Continue to single crochet around without slip stitching at the end of each row. That way there is not a seam. At the end of Row 10 slip stitch, cut your yarn and weave in the ends. 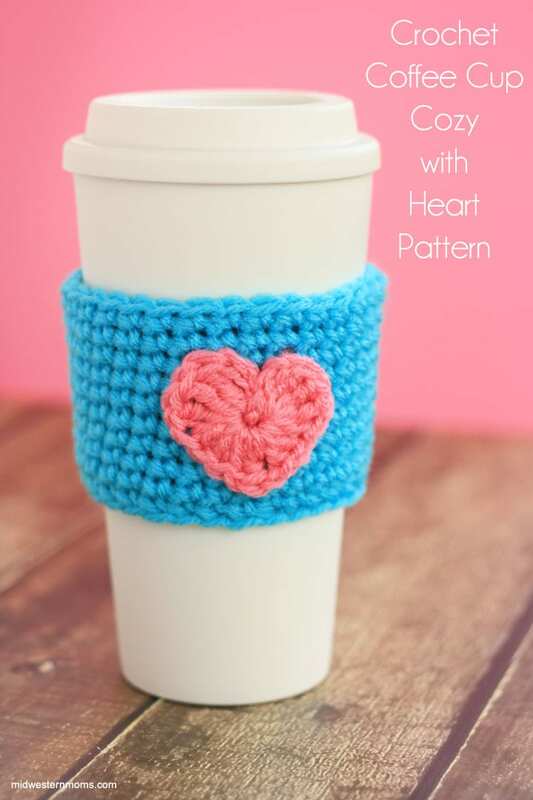 HEART: Use the pattern for the small crochet heart. Leave a long tail when you are finished. 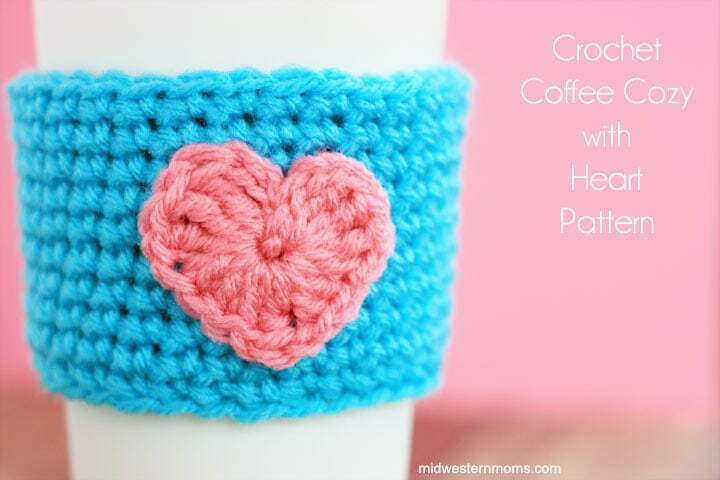 Use the tail to sew the heart onto the coffee cozy. This pattern works up pretty quickly. I can’t wait to make another one! Absolutely darling! I love this. Too cute, Devon! I’m going to add this to my 2015 craft bucket list! It’s so cute! I would love for you to link up to the Stitch It, Blog It, Share It Link Party Sunday nights at 7pm at BehindtheSeamsSewing.com. This a very pretty coffee cozy. I love the contrast between the blue & pink. Beautifully done! This is so cute. Love it. You do such cute stuff. Starting my first Crochet coffee cup cozy. They are so cute. Wish me luck. Have a beautiful day friends. Good luck! I am trying to make a new coffee cup cozy pattern and so far I don’t have it right yet. Hope I can figure it out soon.